It can be hard to find truly authentic Italian food in the states. While some may try to imitate the flavors and styles of this delicious cuisine, not many can get it just right. But Chef Marc is different. With over 40 years of culinary experience and regular trips to Italy to master his craft, Chef Marc is able to create the authentic Italian taste. At Chef Marc’s Trattoria, we offer delicious food and drink options that will wow your senses and transport your to the Tuscan countryside. Located in Las Vegas, our Italian restaurant opened in 2015 and has made a statement in the Vegas food industry. With a specialties menu, a dinner menu, and an awesome happy hour menu, you can find so many delicious choices and explosive flavors. Chef Marc started cooking as a teenager, helping his parents in their restaurant in south Florida. As he gained more experience, his parents let him run the restaurant during the lunch hours and soon started another restaurant that he could help run. Chef Marc has been in the restaurant business ever since, working in different areas around the US, until finally settling in Vegas. Chef Marc has an extensive history in culinary practice, which helps him create the delicious meals featured on our menu. 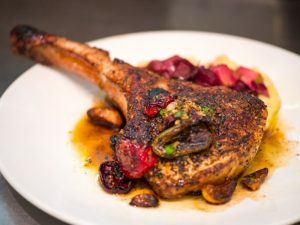 Let’s take a look at some of the most popular menu items that can be found at Chef Marc’s Trattoria. Read on to learn more about our delicious options and once your work up an appetite, make a reservation or order take-out! The perfect mix of seafood, spices, and flavor, the Hot Seafood Antipasto is a great starter option at Chef Marc’s. If you have a love for seafood, this is a great option to wow the palate and try a variety of different options. 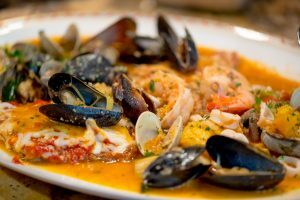 This Venetian platter includes assorted shellfish, a delectable eggplant parmesan, clams oreganata, calamari, and wild shrimp, simmered in a sherry wine seafood sauce. These flavor-packed options can give you a taste of what the rest of the meal will consist of. There are many delicious pasta entrées, which should be expected at an authentic Italian restaurant. The tricky part will be choosing just one! We have something for everyone, from options with seafood to spicy pasta choices, and more. Try the Linguini Nero, with a spice level of one through four. This black pasta is topped with calamari, wild shrimp, hot chili peppers, aioli, and pomodoro, creating a tasty dish that you won’t be disappointed with! But if you are not a fan of seafood, we have something for you as well! The Chicken Riggies, also with your choice of spice level, may be the perfect option. This is a chicken and pancetta dish in a pink sauce and topped with mushrooms, hop peppers, and mozzarella. We offer many different meat options as well, deliciously prepared with explosive flavors and authentic tastes. From the classic chicken parmesan to veal, you have a wide variety of meat to choose from. Our Veal My Way features a slice of veal, topped with assorted mushrooms, house pancetta, and cognac truffle cream. These are only a few of our many delicious options and flavors! Be sure to check out the rest of our menus and make a reservation today. Contact us with any questions about our menu. ©2018 Chef Marc's Trattoria - Do not copy. All rights reserved.